NIA CHARLESTOWN NEVIS (December 15, 2016) — The Nevis Water Department (NWD) will continue to upgrade water distribution systems on Nevis in 2017, with planned pipe upgrades in the Brown Hill area and other parts of the island. Hon. 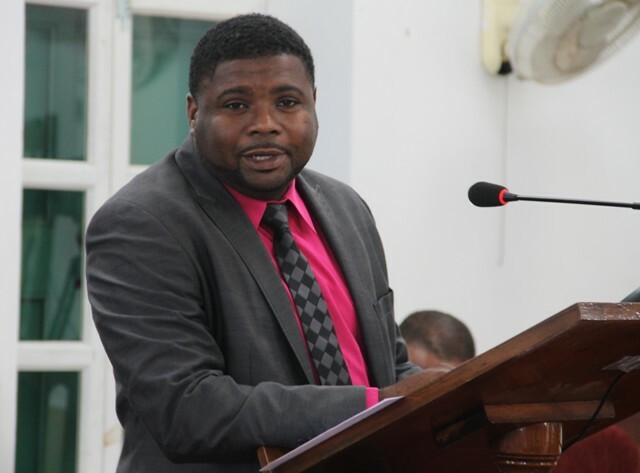 Troy Liburd, Junior Minister in the Minister of Communications, Works and Public Utilities, said at a recent sitting of the Nevis Island Assembly that the upgrades would be done in conjunction with the Public Works Department who will be engaged at the same time in road works. “This will coincide with works to be carried out by the Public Works Department on the Brown Hill Road Rehabilitation Project. “They will also be fully engaged in pipe upgrades in the Shaw’s Road area and this will be in conjunction with works to be carried out on the Shaw’s Road Rehabilitation Project. These piping networks we expect them to go along Shaw’s Road up to Gore Hill, all the way up to Fountain,” he said. In addition, the NWD hopes to bring relief to consumers in areas experiencing low or no water pressure. Mr. Liburd described the project as an ambitious but necessary one. He explained that one of the reasons for expanding the Nevis Water Supply Enhancement Project – by expanding the transmission mains, the second phase of which will commence in 2017 – is to facilitate all the upgrades. The Minister said the larger pipes would carry more flow as opposed to the smaller pipes which results in low pressure which affect consumers who live in higher elevations. Mr. Liburd also used the opportunity to commend the NWD for their service in 2016. “The [Nevis] Water Department has worked hard in 2016 and they will continue to work hard in 2017 and we will be there to support them. “I want to commend the manager of the department and the staff of the department and I want to encourage them to keep on doing what they are doing. Keep on striving to improve,” he said. Meantime, Mr. Liburd stated that laying water mains is labour and equipment intensive and told local service providers they should prepare to take advantage of the opportunities that would become available when the NWD projects begin in 2017. “It has been the policy of this government, that wherever possible, that we utilise as much of our local equipment providers, our local truckers and our local labourers, as possible. “What I have outlined here for 2017 is a lot of work on the water side and so, our local service providers can look out in 2017 because the water department will have a lot of work going on and a lot of work for them,” he said.